I have a confession to make: I'm a big old insufferable anglophile. I even watch Mr. Palfrey of Westminster on PBS, that's how bad it's gotten. This obsession extends to the gastronomic - I always try to have a can or two of Heinz beans on hand, and I'm never without my PG Tips tea. 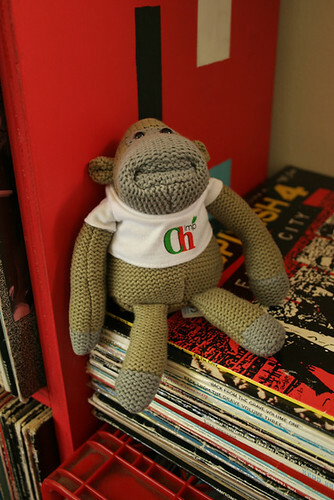 So when one of my flickr contacts, bettybean, posted a photo of a knitted chimp toy that came free with a box of PG Tips, I got a little excited. Knitted toy! Chimp! PG Tips! Could it be any more perfect? I commented to that effect, and she offered to send me one, direct from London. And here it is. Again I say: hooray for the internet. Thanks bettybean! Completely unrelated, but if you'd like to see a photo (taken by Rain) of me with comic genius Brian Posehn, here you go. Here are two free pattern links to knit the same monkey! LOVE the Chimp. He looks a little bemused by his recent travels. I also love Brian Posehn. Just saw him with Patton Oswalt on Sunday in the Independent. Hilarious! You look super cute and happy in the photo. Doesn't he look slightly patient & resigned all at once? His face just makes me laugh. Lucky you! heehee who doesn't love monkeys? and tea? lucky gal. PG tips! Why don't they give away knitted monkeys over here? I just love your stuff. I've been seeing your awesome robots everywhere and just wanted to say hi from Kansas City and to wish you much success. i love how hard you are laughing in that brian p. and you photo. pg tips and a monkey! i couldn't have thought up a better combination. i'm going to go make a cuppa right now.